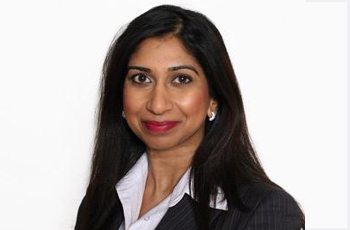 Suella Fernandes has served as Conservative MP for Fareham since 2015. Recently in the June 2017 General Election, Suella received 35,915 votes, which equaled a 63% majority, retaining her seat. Born in Harrow and having grown up in Wembley, Fernandes belongs to a family that is proud to serve its local community. Her parents came to the UK from Kenya and Mauritius in the 1960s. Her mother, who was recruited by the NHS as a nurse, was a Councillor for 16 years, and her father, who worked for a housing association, was a campaigner for local people. Fernandes earned scholarship to attend a local independent school, and from there she earned a place to read Law at Cambridge University, achieved a Masters at the Sorbonne in Paris, and qualified as an Attorney through the New York Bar exams - which gave her a great depth of insight into the social and legal frameworks of the US and Europe. She firmly believes in the Conservative values of self-empowerment, service, and taking responsibility. She's proud that the Conservative party offers individuals aspiration to improve their lives and the lives of others no matter where they start from.